The first OPPNA artist interview is up now. Thank you Reiko for including me in the first issue of Oppna, an on-line Japanese lifestyle magazine! Use Google to translate the Japanese into English text. The results are wacky but close. Just search "Oppna Sandkuhler" and select the translator. New Book displays wire and fused jewelry in beautiful assemblages; inspired by a lifetime of experience through an expert artist and experienced teacher. These designs will satisfy your creative urges and build your skills using wire and fused jewelry techniques. Learn every step of the wire fusing process. Starting with a detailed discussion of the tools and materials, this book encompasses a lifetime of trial and error experience, saving you time and advancing you toward success. 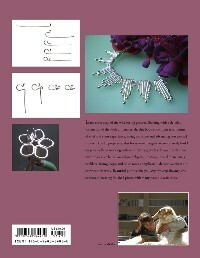 The 10 projects in this book were designed to successively build on your skills in working with wire. Starting with a charm bracelet, you will progress to harnessing found objects, creating a tiered “matchstick” necklace, fusing loops, and on to more complicated, decorative chain and composition work. 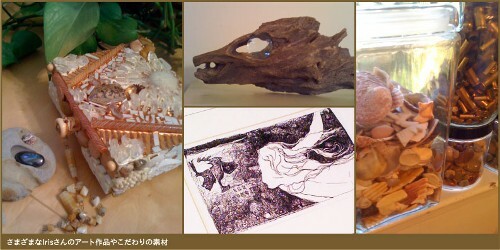 Beautiful photos take you step-by-step through the process of creating pieces offering many possible variations. 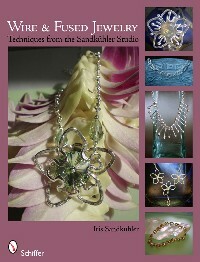 Iris Sandkühler, a professional jewelry designer and teacher, is also an artist based in Northern California. Her broad range of art forms include eclectic collages/montages, pen-and-ink figurative drawings, exquisite handcrafted gold, silver, and copper jewelry, and whimsical accessories. This book is published by Schiffer Publishing, Ltd., based in Atglen, PA on the Schiffer Book Farm, known for publishing high quality Antique, Arts, Architecture, Lifestyle, and Military History books, as well as a successful line of ghost books. Visit Schiffer online at www.schifferbooks.com or contact them at 610-593-1777. If you are interested in reviewing or excerpting this title for your publication/newsletter or website, please contact marketing@schifferbooks.com. On jury duty for three weeks. No kidding. Over the years, several students have suggested that I teach somewhere outside of the San Francisco Bay Area so they have a good excuse to get away for a couple of days. Here is another opportunity for you to join us. For more information about this fabulous weekend, email me with "Beach Glass Retreat" in the subject line and I'll send you the details in a PDF. 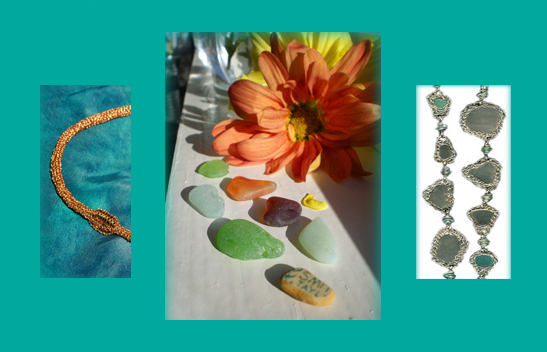 Glass Beach Retreat is This Coming Weekend! Many thanks to students (local and afar), colleagues and friends, for a fantastic 2009! Your support made it a truly great year full of many creative adventures. Without you, I would be that proverbial tree falling in the woods wondering if I made a sound. Thank you for being there and I'm looking forward to seeing you in 2010. Each spring, on the weekend before Valentines Day, we get together to work on the unsupported version of the Viking Knit and Viking Bezel Knit at the Glass Beach Retreat in Northern California. These techniques are a great way to capture sea glass and similar found objects. Students of all ages and abilities are invited to take part. Return students are welcome to further their skills. Even dogs are welcome! 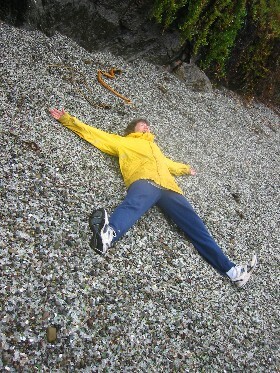 To find out more and see the itinerary, email isandkuhler@yahoo.com with the subject line "Glass Beach Retreat." Hope you can make it! I've been working quietly behind the scenes, not just uploading workshop and project images onto Facebook, but generally getting used to Facebook-ing, tweeting, TeachStreet-ing and checking Yelp reviews (thanks Marie L.! ), while trying not to get totally sucked in and hopelessly distracted from doing "actual" work. In this corporate race to build the most popular social media network, I hope we don't get stretched thin by participating in too many virtual places and forget to visit each other in person. 2009 turned out to be the busiest year yet for private lessons at the studio. Perhaps a lot of folks are looking for new places and people to study with since lots of school programs are severely downsizing. Coming from Norway, Tone traveled the furthest to spend a day working on advanced fusing skills. Having "met" her several years ago via distance learning lessons, it was great to finally work with her in person. During summer vacation, a Canadian tribe of wild women (jokesters) came to Sandkühler Studio to study jewelry techniques for a whole week. One of their antics included constantly referring to flush cutters as flesh cutters. I picked up on it and still catch myself saying in class. We had such a great time that they invited me to come up to their neck of the woods this summer to teach. Check out their photos in an earlier Facebook album. I want to thank the Alaskan students, some of whom camped out in their cars, waiting for The Alaskan Bead Company to open on the day of registration. By the time I arrived, all the classes were full and a few, over capacity. Some of the staff members participated by sitting "stage left" in the stock room. If you see the "Where's Waldo" type photos in the Facebook Alaskan Photo Album, you'll know your looking at the stockroom "annex". Don't forget to tag yourself and/or your projects. 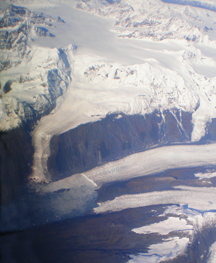 Enjoy the awesome aerial photos of glaciers. In May of this year, you'll find me engaging in "professional development" (learning new metalsmithing tricks) while in Germany and Turkey. June, workshops and private lessons will be offered again in North Carolina and Georgia. July takes me to Bellingham, Washington and Canada. When the October rainy season begins in the San Francisco Bay area, I'll be headed west to teach on the islands of Maui and Oahu again. Want to see the venues, students and their projects? Every single workshop has been represented on Facebook under my name. If you like what you see, mark your calendar and put in your private lesson requests early 'cause I'm coming back! The newest distance learning lesson is in development. 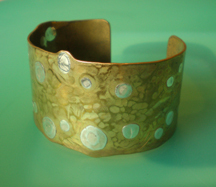 It's a cold metal inlay technique that you can use to join differently colored metals and create (for example) polka dotted sheet metal to transform into bracelets, earrings etc. It will take approximately two months to test, write up and photograph. If you'd like be a beta tester, the pre-sale cost is $35.00. Once the lesson is finished it will cost more but as a tester, you're eligible for free updates at any time. To find out more about being a guinea pig, email isandkuhler@yahoo.com with the subject line: What's Available and How Much.